even a uniek possibility to say the score, through inplemented voicerecognition software. The program can be controlled with speech commands, so inputting score has never been so easy! 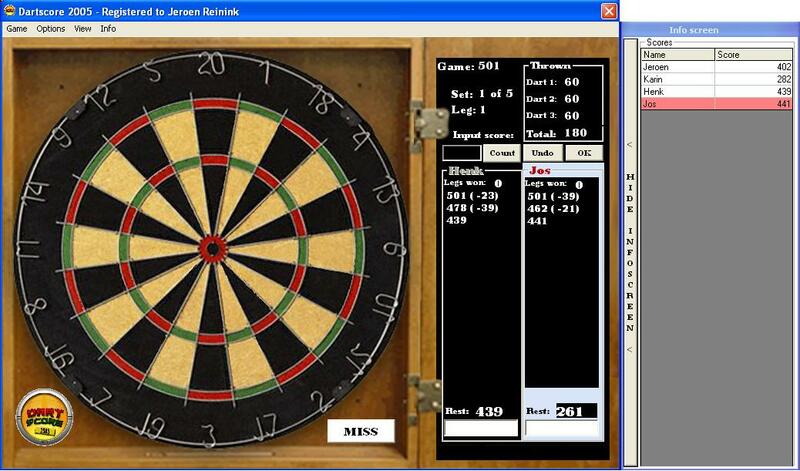 The program keeps track of each players turn, and indicates how many darts and how much points each player has left. Further, it supports "undo" when you've made a mistake. The program automatically detects when the game is over, and displays the statistics of the game or leg for each player. the points left can be spoken out by the computer, and the score can be spoken by a real Embassey reporter. Qweas is providing links to Dartscore 2005 2.1.4 as a courtesy, and makes no representations regarding Dartscore 2005 or any other applications or any information related thereto. Any questions, complaints or claims regarding this application Dartscore 2005 2.1.4 must be directed to the appropriate software vendor. You may click the publisher link of Dartscore 2005 on the top of this page to get more details about the vendor.